Sometimes early last year I purchased a Canon LIDE 210. It gets very low usage. And, so every time I need to use it, it feels new. The scanner is close to a plug and play device. Unfortunately, my MS Windows 7 Computer did not recognize it. And, so went online and downloaded a driver for it. The driver installation went smoothly. Using the “Windows Fax and Scan” application that is bundled with Windows 7. The application is quite easy to use, once started we have a fairly intuitive window. The “Preview” button does the work of getting us our first draft. Here is what we received once we chose the Scan option. The single document came in as two pages. A couple of months ago I had to scan a document. Did so on my sister’s laptop running MS Windows 8. Since then I have tried to get the same application, Canon – MP Navigator Ex, to work on my Dad’s laptop. His laptop is a “HP G70” running Vista. The error message I am getting once I launch the Application is pasted below. The scanner driver supported by this software is not installed. Install it and then retry. Downloaded and installed Application a few times already. 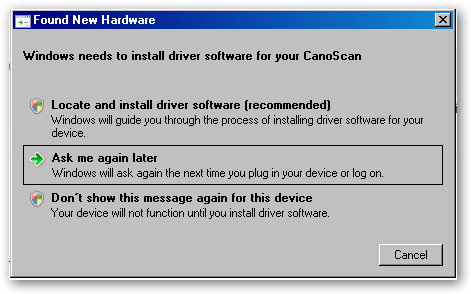 I visited http://www.usa.canon.com/cusa/consumer/products/scanners/photo_scanners/canoscan_lide210#DriversAndSoftware and downloaded the “Windows Vista (x64)” driver. And, was able to install the Application. 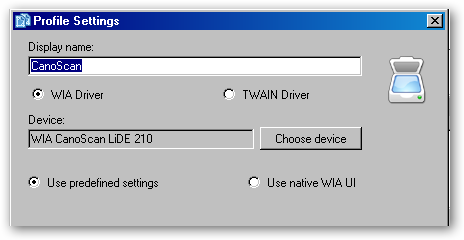 I then downloaded and tried to install the “Windows Vista (x32)” driver. But, was unable to get it to work. 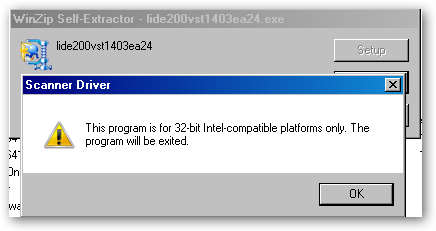 This program is for 32-bit Intel-compatible platforms only. The program will be exited. Reviewed MS Windows Event Viewer and was able to track that USB Installation occurred. User-Pnp 20001 Driver Management concluded the process to install driver FileRepository\cnq4809.inf_20985667\cnq4809.inf for Device Instance ID USB\VID_04A9&PID_190A\5&58EBB3E&0&1 with the following status: 0. User-Pnp 20003 Driver Management has concluded the process to add Service usbscan for Device Instance ID USB\VID_04A9&PID_190A\5&58EBB3E&0&1 with the following status: 0. 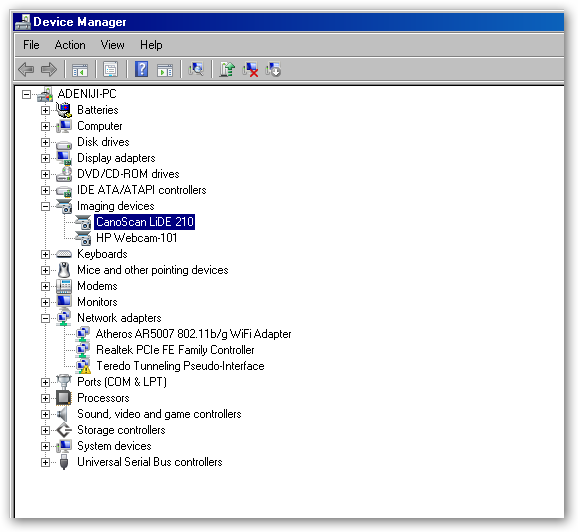 Launched Control Panel \ System \ “Device Manager” and verified that device is recognized. The device is found under “Imaging Devices” and it is labelled “CanoScan LiDe 210“. Retried launching MP Navigator-Ex, but same error message: “The scanner driver supported by this software is not installed. Install it and then retry“. Ran “Driverquery.exe” and looked to see if I can find a driver bearing the Canon name. But, nothing. Looked for drivers bearing “Canon” signature. Confirmed that things are working well by querying for Realtek. Still MP NavigatorReview Ex 2.0 will still not work. Same error message. I thought to myself, why not try other Scanning Software. And, so did so and they all worked! 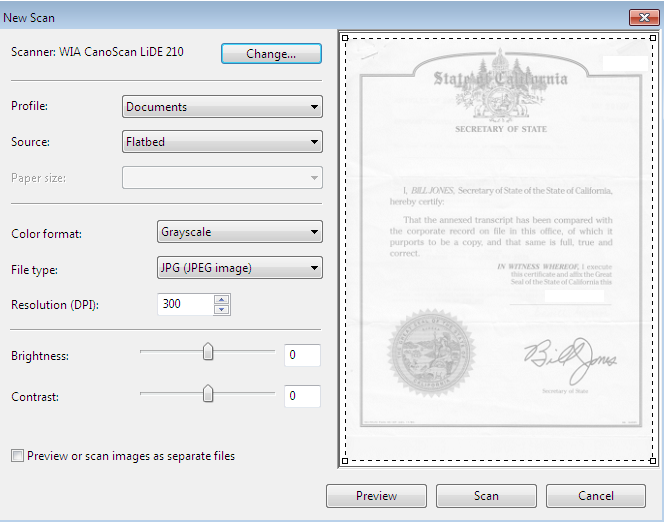 Here is a screen shot of the types when configuring Scanner through “Not Another PDF Scanner”. 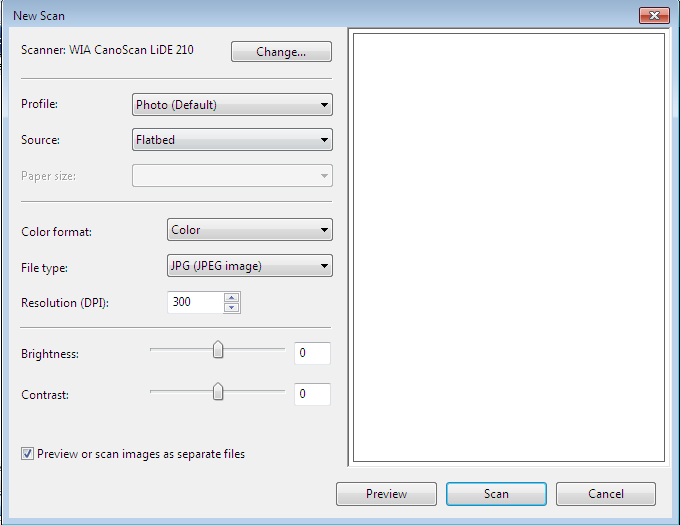 The Canon’s CanoScan is a slightly modern scanner and it uses the WIA Driver. You can read more here about WIA via links listed in the Reference section. In summary, though the bundled App (MP Navigator Ex) is having problems, there appears to be enough technology built into MS Windows WIA Subsystem that other Applications can still successfully access and use our scanner.